Whatever your dietary requirements, I think we can all agree that cake is awesome, whether it's vegan, gluten free, or full of butter, chocolate and sugar. So here are the most lovely bird-themed nest (see what we did there?) of cake tins, to keep your cakes, pies and biscuits fresh. The perfect present for anyone with a sweet tooth, preferably with cake included, obviously. 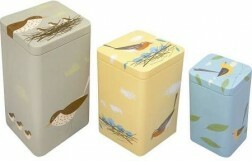 Set of 3 nesting tins. Diameters: Large 10.5 inches; Medium 8.5 inches; Small 6.5 inches.